How much time do you spend every day scrolling through hundreds of Windows Server logs across your network and keeping an eye on storage space so those logs will be available for your next audit check? Netwrix Auditor for Windows Server helps you gain control over what’s going on across your Windows servers by empowering you with efficient event log management, so you can stay alert to critical events and slash preparation time for compliance audits. To effectively utilize event log data and prove your compliance with the strict requirements of SOX, HIPAA, PCI DSS and other standards, you need to regularly review Windows server event logs. 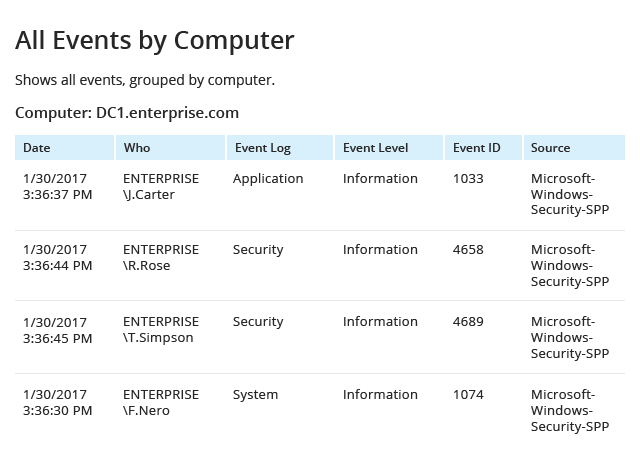 The native event logging tool Microsoft Event Viewer enables you to view and analyze events — but you have to do it one server at a time. Can you really afford to spend your precious time sifting through endless Windows event logs, security logs, application logs and application services logs spread all over your network? Plus, storing all that uncompressed log information means constantly worrying about how much free disk space you have left.